GENEVA: The number of people in Zimbabwe affected by a devastating cyclone and flooding has jumped to 200,000, with most of the damage occurring near the Mozambique border, the UN said Thursday, reports AFP. The initial estimate of those hit in Zimbabwe was 15,000 but World Food Programme (WFP) spokesman Herve Verhoosel told reporters in Geneva that the numbers had surged following an overnight assessment. The situation in Zimbabwe’s eastern district of Chimanimani on the Mozambique border “is very bad,” Verhoosel said. Zimbabwe’s state broadcaster ZBC has also raised the death toll to 139, up from 100 on Wednesday. Five days after tropical cyclone Idai cut a swathe through Mozambique, Zimbabwe and Malawi, the full extent of the devastation is not yet clear. In hardest-hit Mozambique, an estimated 400,000 people have been displaced, according to the UN. 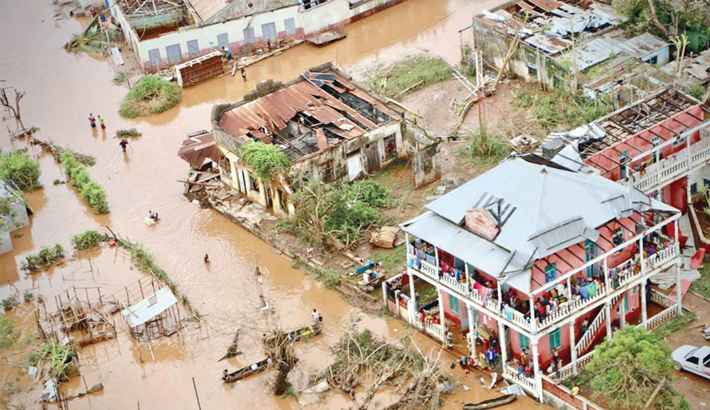 As of now, the number of people in Mozambique affected by the storm and floods is 600,000, Verhoosel said, citing government figures. But “that number will definitely go up,” he told reporters. The WFP believes it is possible that a total of 1.7 million people in Mozambique will need assistance as a result of the weather-related disasters, Verhoosel added. Aid workers are racing to locate survivors, some of whom may still be stranded on rooftops or in trees.